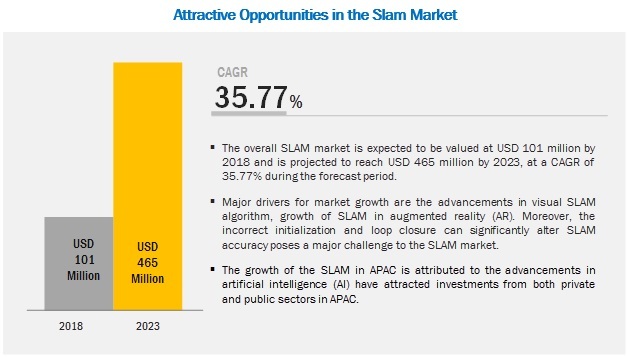 [127 Pages Report] The overall SLAM market is projected to reach USD 465 million by 2023 from USD 101 million in 2018, growing at a CAGR of 35.77% during 2018-2023. The study involved 4 major activities in estimating the current size forsimultanesous localization and mapping (SLAM) market.. Exhaustive secondary research was done to collect information about the market, peer market, and parent market. The next step was to validate these findings, assumptions, and sizing with industry experts across value chain through primary research. Both top-down and bottom-up approaches were employed to estimate the complete market size. Thereafter, market breakdown and data triangulation were used to estimate the market size of segments and subsegments. In the secondary research process, various secondary sources have been referred to for identifying and collecting information important for this study. These secondary sources include annual reports, press releases, and investor presentations of companies; white papers; and certified publications and articles from recognized authors, directories, and databases. In the primary research process, various primary sources from both supply and demand sides have been interviewed to obtain qualitative and quantitative information important for this report. The primary sources from the supply side include industry experts, such as CEOs, VPs, marketing directors, technology and innovation directors, and related executives from key companies and organizations operating in the automated SLAM market. After complete market engineering (including calculations regarding market statistics, market breakdown, market size estimations, market forecasting, and data triangulation), extensive primary research has been conducted to gather information as well as verify and validate the critical numbers arrived at. In the complete market engineering process, both top-down and bottom-up approaches have been implemented, along with several data triangulation methods, to estimate and validate the size of the SLAM market and other dependent submarkets listed in this report. After arriving at the overall market size from the estimation process explained above, the overall market has been split into several segments and subsegments. To complete the overall market engineering process and arrive at exact statistics for all segments and subsegments, market breakdown and data triangulation procedures have been employed, wherever applicable. The data have been triangulated by studying various factors and trends identified from both demand and supply sides. Along with this, the market size has been validated using both top-down and bottom-up approaches. Intel (US), Microsoft (US), Alphabet (US), Amazon Robotics (US), Apple (US), Clearpath Robotics (Canada), Aethon (US), The Hi-Tech Robotic Systemz (India), Facebook (US), Intellias (Ukraine), Magic Leap (US), Rethink Robotics (US), Skydio (US), NavVis (Germany), MAXST (South Korea), and Mobile Industrial Robots ApS (Denmark). This research report categorizes the SLAM market based on offering, type, application, and region. The overall SLAM market is projected to reach USD 465 million by 2023 from USD 101 million in 2018, growing at a CAGR of 35.77% during 2018-2023. 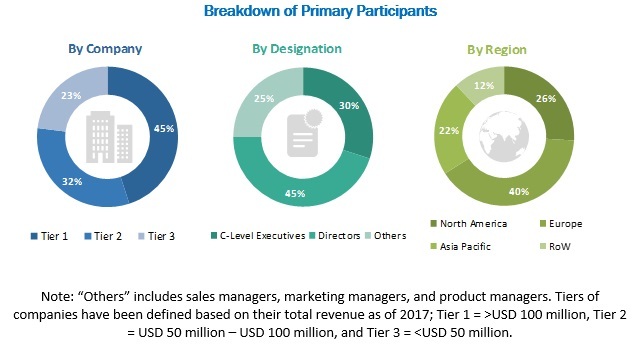 Major drivers for the market’s growth are the advancements in visual SLAM algorithm, growth of SLAM in augmented reality (AR), and growing demand for self-locating robotics in homes and enterprises. Huge middle-class population, along with rising disposable income, in developing countries will act as a growth catalyst in these counties. This, in turn, is expected to drive the SLAM market during the forecast period. Advancements in SLAM technology, like improving mapping accuracy, flexibility from cloud services, and better user experience compared to its counterpart (marker-based technology) are expected to propel the growth of SLAM in AR/VR applications during the forecast period. The market for 2D SLAM is expected to continue commanding a larger share of the market than 3D SLAM owing to its increasing use in domestic robots. For instance, in September 2018, ILIFE INNOVATION (China) launched A7, a new pro robot vacuum cleaner, worldwide on Amazon and AliExpress as a premium addition to its A-series robots. Increasing SLAM adoption for automation, coupled with expanding applications of UAVs, has led the path for the market’s growth in the region. The reason for the dominance of the US in North America is its well-established economy, which allows for investments in new technologies. Key players in the SLAM market include Intel (US), Microsoft (US), Alphabet (US), Amazon Robotics (US), Apple (US), Clearpath Robotics (Canada), Aethon (US), The Hi-Tech Robotic Systemz (India), Facebook (US), Intellias (Ukraine), Magic Leap (US), Rethink Robotics (US), Skydio (US), NavVis (Germany), and Mobile Industrial Robots ApS (Denmark). Intel (US), in association with Mobileye (Israel), launched a road experience management (REM) platform—an HD mapping solution that uses data collected by REM-capable vehicles to build maps that can be used in ADAS and autonomous driving systems. Intel (US) collaborated with Waymo (US), a subsidiary of Alphabet, to provide computing power required for Level 4 and 5 autonomous vehicles. Amazon (US) announced its plans to launch Vesta, a domestic robot that can support functions such as home security, diary reminders, and chat. What upcoming applications are expected to adopt SLAM technology? How are companies adopting SLAM for robotics? How is SLAM influencing the AR/VR market? How are companies addressing the challenge of complexity in designs of data association in visual SLAM? * Business Overview, Solutions/Products Offered, Recent Developments, SWOT Analysis, and MnM View Might Not Be Captured in Case of Unlisted Companies.